Top photo, from left, Barry McGraw (Ohio Soybean Council), Keith Kemp (Ohio Soybean Council), Dr. Ben Curatolo (Light Curable Coatings), Micah Sanders (Quick Cure Protective Coatings) and Jim Sonnett (Redwood Innovations). Bottom photo, from left, Barry McGraw (OSC), Dr. Ben Curatolo (LCC), Micah Sanders (QCPC), Keith Kemp (OSC). Jim Sonnett (RI) not pictured. 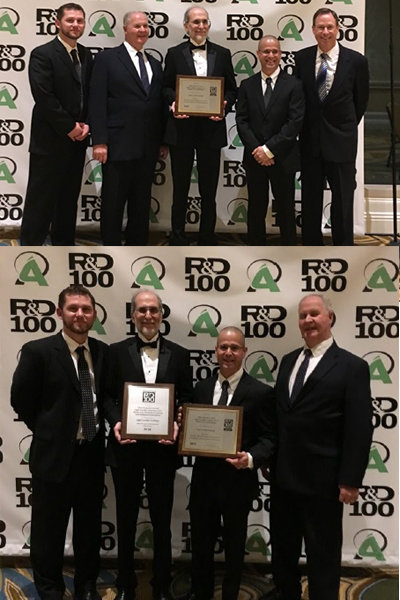 Light Curable Coatings (LCC), Berea, Ohio, and Quick Cure Protective Coatings (QCPC) were announced as winners of a 2018 R&D 100 Award on Nov. 16 at the 56th annual R&D Awards Program in Orlando, Florida, for a UV-curable industrial floor coating based on bio-renewable materials. The clean, green industrial floor coating is solvent-free with no volatile organic compounds (VOCs), provides exceptionally fast cure and meets or exceeds industry targets for appearance, hardness, adhesion, solvent resistance and application temperature. LCC and QCPC won as co-developers with The Ohio Soybean Council (OSC) and Redwood Innovations (RI) in the Mechanical/Materials category. LCC and QCPC also won an additional 2018 R&D 100 Special Recognition Merit Award for Green Tech for the bio-renewable floor coating with the same project team. The R&D 100 Awards honor the 100 most technologically significant innovations of the past year and are selected by an independent panel of more than 50 judges representing R&D leaders in a variety of fields. Other Special Recognition Winners included Idaho National Laboratory, Los Alamos National Laboratory and Sandia National Laboratories. 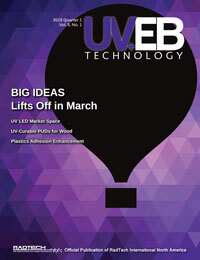 Light Curable Coatings provides solvent-free, high performance UV-curable coatings for industrial and aerospace applications as a replacement for epoxies and polyurethanes. Quick Cure Protective Coatings provides professional installation, training and product sales for the high-performance UV-curable technology. For more information, call LCC at 216.642.0626 or QCPC at 216.276.4011.